The bar chart compares the percentage of families owned their house and rented their accommodation in England and Wales from 1918 to 2011. 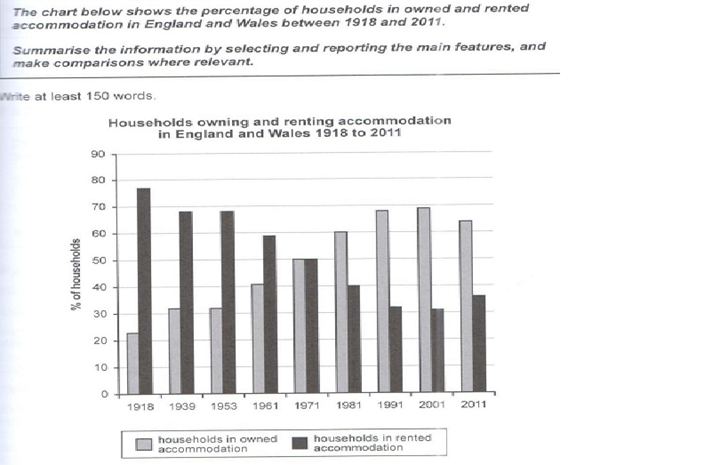 Between 1918 and 2011, it is clear that the people in England and Wales tended to own their house rather than rent accommodation. Looking at the chart, during this period of time, the number of owned houses rose gradually from roughly a quarter to over 60%, whereas these figure of households in rented accommodation fell moderately, only a half of the number in 2011. In 1918, the percentage of households in owned accommodation, with under a quarter, was almost four times lower than ones in rented accommodation, with almost 80%. By contrast, this percentage was twice higher than the other. However, from 2001 to 2011, while the number of house owners decreased slightly, the number of renters increased steadily. Interestingly, fifty percent of families lived in both their own house and rented accommodation in 1971. The bar chart compares the percentage of families owned their house (ungrammatical) and (missing words) rented their accommodation in England and Wales from 1918 to 2011. In 1918, the percentage of households in owned accommodation, with under a quarter (A quarter of a percent? ), was almost four times lower than ones in rented accommodation, with almost 80%. By contrast, this percentage was twice higher (wrong usage. You said four times, and not you say two times. This is contradictory.) than the other. However, from 2001 to 2011, while the number of house owners (The chart does not show how many home owners or renters there were. That number might be 100 million, for example.) decreased slightly, the number of renters increased steadily. Interestingly, fifty percent of families lived in both their own house and rented accommodation (Did families live in two different places at the same time? ) in 1971. The chart illustrates the percentage of people who live in their own or rented houses in England and Wales from 1918 to 2011. Overall, a larger percentage of people lived in rented houses before 1971 however, over the years these figures gradually declined and an increase in housing ownership can be seen. In 1918 the percentage of people living in rented accommodation was the highest at around 80% while in 2001 only 30% of people lived in rented houses being the lowest. A sharp decline is seen in the graph till the year 2001 but only a rise of 5% in the next 10 years. In 2001, around 60% of people had their own house which is three times higher than those living in 1918. A gradual increase in the graph can be seen over the years. Further, in the year 1971, an equal number of people lived in rented and owned houses. The (what kind of chart?) chart illustrates the percentage of people who live (You need past tense verbs.) 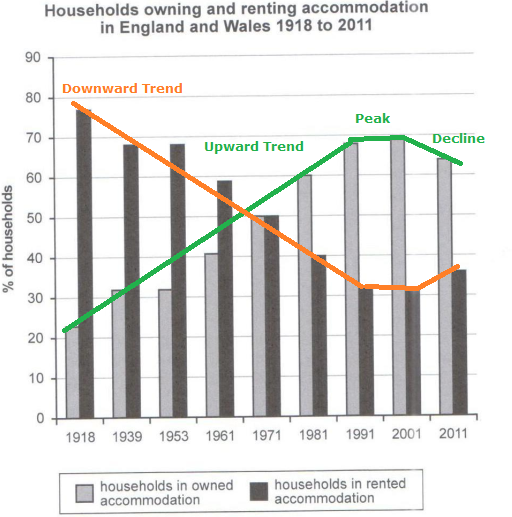 in their own or rented houses in England and Wales from 1918 to 2011. Overall, a larger percentage of people lived in rented houses before 1971 (The sentence ends here, so you need a period. The next word needs to begin with a capital letter.) however, over the years it these figures gradually declined and an increase in housing ownership can be seen. In 1918 the percentage of people living in rented accommodation was the highest at around 80% while in 2001 only 30% of people lived in rented houses, the lowest point over the time period. being the lowest. A sharp decline is seen in the graph till the year 2001 but only a rise of 5% in the next 10 years. In 2001, around 60% of people had their own house which is three times higher than those who lived living in 1918. A gradual increase in the graph can be seen over the years. Further, in the year 1971, the owners equaled the renters in number. an equal number of people lived in rented and owned houses. Here is a model essay you can study. Note that the sum of renters + owners always equals 100, so, after writing that, you can focus on either the owners or the renters. The trends will be opposite. Note my green and orange trend lines on the diagram, which I used to describe the main features of this chart in the model essay. The bar chart illustrates the changes in the percentages of families living in England and Wales who owned their own homes over the 93-year period from the end of World War I (1918) to 2011. The bar chart also plots the percentage of families who rented. Nine points in time are shown. The total of these two values adds up to 100% at each time point. Overall, home ownership increased substantially, the renters outnumbering the homeowners in the first four decades, and homeowners dominating in the last five decades. At the beginning of the period, 1918, 78% lived in rented housing, and the remaining 22% owned their own homes. At that time, there began a general upward trend in home ownership, increasing to a peak of 70% in 1991. There was an intervening period (1939-1953) where the percentage hovered around 33%; that is, one third of the population owned their homes and two-thirds rented. In 1953, the increase in ownership resumed. The numbers of owners and renters were equal (50%) in 1971. The steepest rise in home ownership was between 1939 and 1971, increasing at a rate of about 1% per year. After another stable period, 1992-2001, the trends reversed and the percentage of home ownership declined from its peak of 70% to 65% at the end of the period, 2011. The rate of decline in the last decade was 0.5% per year. In conclusion, the graph can be divided into five time periods: first,1918-1939, with increasing home ownership, second,1939-1953, a period of stability, third, 1953-1991, with a rapid growth in ownership, fourth,1991-2001, a period of stability and fifth, 2001-2011, with a decline in ownership. I truly enjoyed your essay, AS. AlpheccaStars increasing at a rate of about 1% per year. => a 32% increase from 1939 to 1971. But according to the chart, there is just an 18% increase in the proportion of homeowners. The steepest rise is actually between 1953 and 1971, 18% within 18 years. Can I post my answer to this chart? Start a new thread in the "essay forum"